Whatever reason for buying a car, whether it is your first set of wheels or the family has grown and you need a minivan, timing is everything. That is, when looking for deals on cars, timing will have a big impact on your bank account. You might need a vehicle right now, but it could save you a lot of money if you were to wait just a couple of months. And if you know you will be making a purchase in the near future, you might save money if you just go ahead and pull the trigger and buy right now. 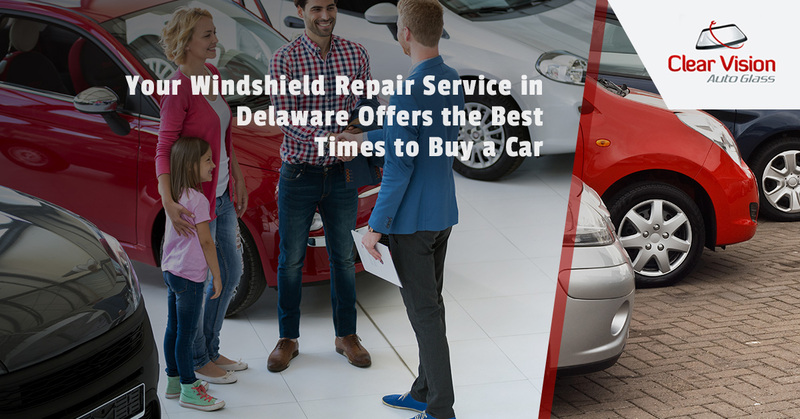 Clear Vision Auto Glass, your windshield repair service in Delaware, offers the best times and worst times to buy a vehicle. One of the best times to buy a car is at the end of the month, any time of the year. So if you really need to make that purchases right away, at least wait until the last few days of the month. Typically, sales managers at dealerships have monthly quotas to hit and if they are falling short, you could get a pretty good deal. You stand a better chance of getting a good deal at high-volume dealerships. Dealers know that they can take a loss on a vehicle because they will make up for it if they exceed their quota and bank a bigger bonus. The bulk of cars are sold on the weekend because nobody wants to take a day off work to shop for a car. And while a dealership will get some business on weekdays, Mondays mark the day the fewest buyers will show up. According to TrueCar.com, average Monday discounts exceed eight percent, which is slightly greater than the rest of the workweek and much better than the discounts you will get on the weekend. The month of May is a good time to buy a car because many manufacturers start introducing new models in June and dealerships need to clear out their dated inventory. To do this, they offer big sales blowouts. Most of us want to go home come quitting time, but car salesmen will not let a serious customer walk away without buying. This means they are much more willing to give you a great deal. Here is a tip: Know exactly which car you want and swing into the dealership just before it closes and get a great deal. Millions of Americans race to the mall on Black Friday to take advantage of great deals on holiday gifts. But what many people don’t know is that dealerships also have Black Friday deals that could save you thousands of dollars on a new vehicle. When a vehicle is a hot commodity and in high demand, that is not the time to buy it. This is when dealerships have the upper hand. Wait until the hype cools before going to the dealership and negotiating. If you plan on trading your car in for a new one, stop by Clear Vision Auto Glass to have the windshield inspected for damage.